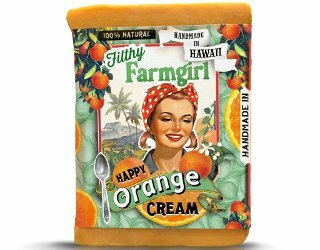 Happy Orange Cream Soap from Filthy Farmgirl (website trigger warning: over the top double entendre). "A classic flavor with loads of Orange Essential Oil, Cocoa Butter & Turmeric Powder. The turmeric (besides being GREAT for your skin) is how we get that rich orange color. This is one of the MOST popular soaps at our summertime farmers markets..." $3 for a small bar, $8 for a large bar. Orange essential oil + cocoa butter… I SO hope it smells like a Terry’s chocolate orange! This is what I was thinking as well! That’s a way to make people follow you! That would be great, but sounds like they are going more for orange sherbet? I love a good sense of humor! Have you tried any of these products? I think I might give them a try . They offer free shipping . I’ve tried their jasmine soap and it was great! I LOVE turmeric but hate double entendres. Feeling very torn . . .
Oh good heavens, I just went crazy! Ordered 4 soaps! With free shipping it was hard to resist. Dam! The beaver soap would’ve made a great stocking stuffer for my sisters here in Canada! I can just hear them snorting with laughter! What hilarious packaging… very fun! Oh, I love these soaps! I saw them in a jewellry store (of all places) in Maui. Picked up a couple of Lucky Duck for myself and a few others to share with some co-workers.